Thank you for visiting for my first recipe post! If you'd like to learn more about who I am and what this blog is all about, please head over to my about page. Now onto this soup! It's no secret that instant ramen isn't exactly the healthiest thing you can eat but its so delicious and perfect for a cold day. With Thanksgiving behind us and Christmas on its way, I'm already feeling the need to detox from all the indulgent food with something warm and restorative. 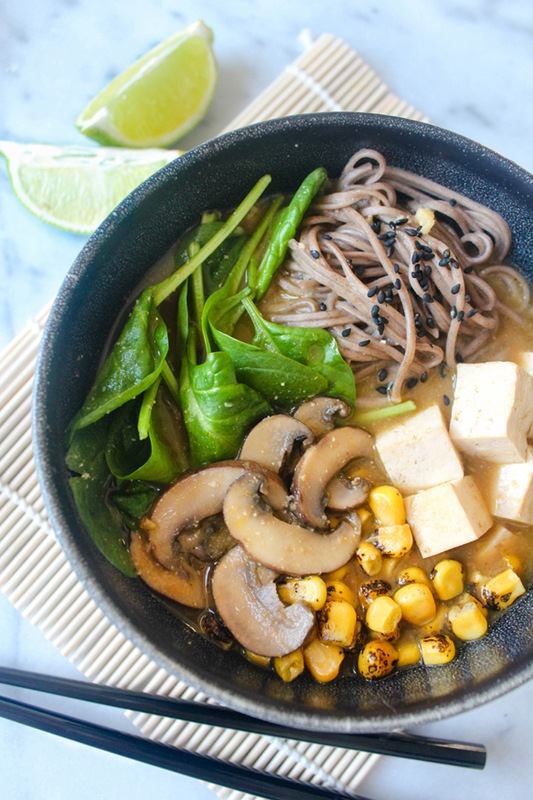 Ramen had been on my mind, so I created this healthy version with miso ginger broth, fresh vegetables, chunks of tofu, and buckwheat soba noodles. 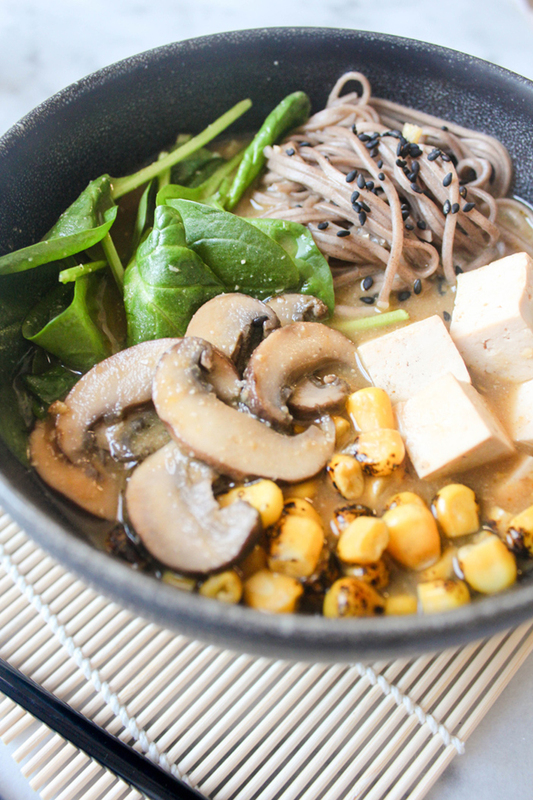 Miso is made from fermented soybeans and it's the fermentation process in part that makes it so high in nutrients. Like other fermented food, such as kombucha, miso increases the beneficial bacteria in the digestive tract (probiotics) that aid in digestion and strengthen the immune system. 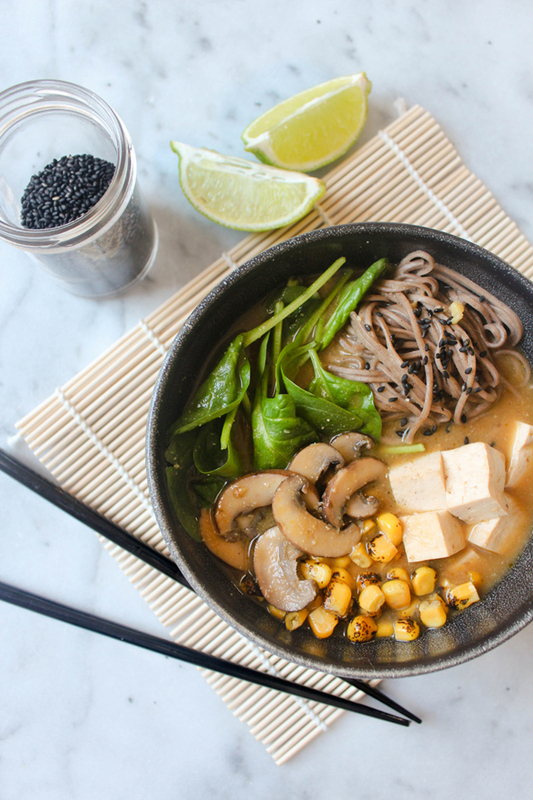 Miso is also particularly high in antioxidants, fiber, and has a large amount of complete protein. 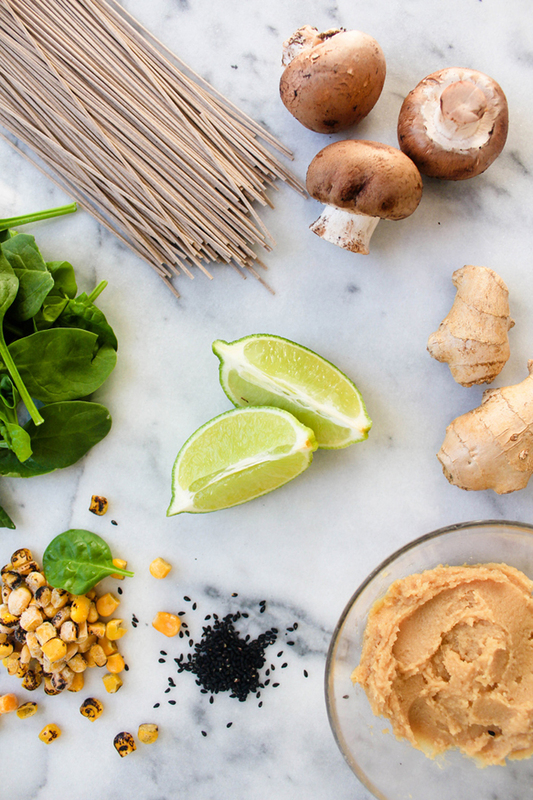 Ginger is a root that is also packed with tons of essential nutrients and rejuvenating compounds. In addition to being a home remedy for several minor conditions, such as an upset stomach, ginger has been known to reduce inflammation and also strengthens the immune system. This miso ginger broth is delicious on its own and is definitely a good remedy if you're feeling under the weather. One of my favorite times to have this soup is for breakfast. That might sound strange but in many countries, a hot soup for breakfast isn't uncommon. In the U.S. it's all about cereal, yogurt, eggs... none of my favorite things. I often look outside the traditional options and go for something like a savory quinoa, hummus toast, or this soup. I think of this miso soup a bit like the winter version of a green smoothie because it's packed with nutrients and is the perfect start to your day. I also love that it can be made ahead of time, heated up, and enjoyed at home before rushing out the door or transported in a mason jar. Give it a try and let me know what you think! -Make the broth: Heat the oil in a large pot over medium heat. Add garlic and ginger and cook for about a minute, being careful not to burn them. Add soy sauce and stir to combine. Add the stock, cover, and bring to a boil. Remove lid, stir in tofu, and simmer uncovered for 10 minutes. - Ladle about half a cup of the broth into a small bowl and stir in the miso paste until dissolved. Pour the miso broth into the pot and cook for another minute or so. 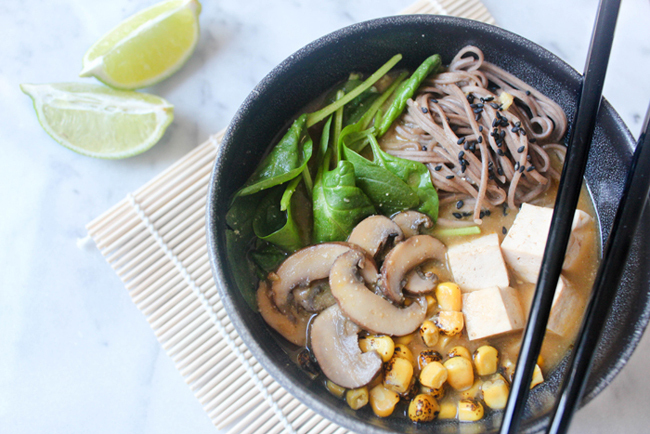 - Assemble the Miso Soba Noodle Soup: Add the mushrooms, corn, and spinach to the broth and cook for a minute or two to soften. 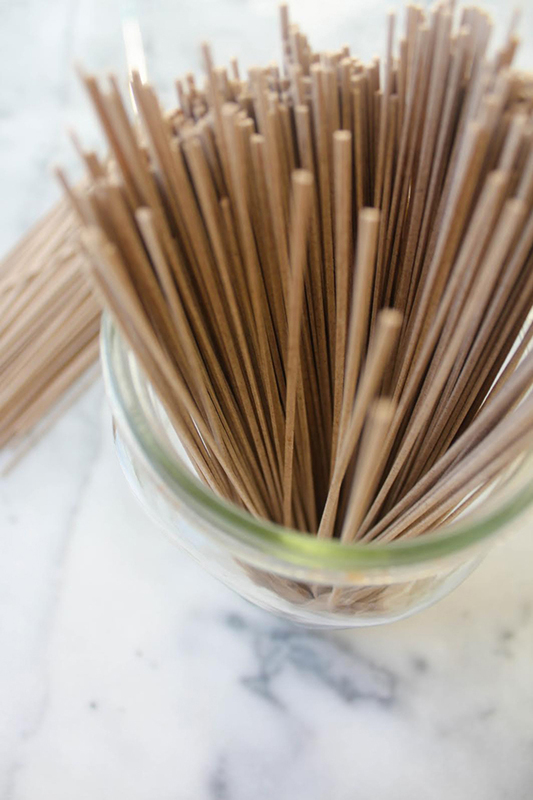 Stir in the cooked soba noodles or divide the soba noodles between two bowls and pour the soup over it. - Add a squeeze of lime and garnish with sesame seeds and a drizzle of toasted sesame oil (if using). Serve immediately. I LOVE the combination of miso and ginger! Such a potent burst of flavor! :) This looks absolutely delicious too. So do I! It is super flavorful and always makes me feel restored too. Thanks so much for stopping by, I hope you give this soup a try and let me know how you like it!